Ever wonder about the rich history behind our custom chocolate bars? During the 1400’s the Mayans took the cacao tree from the rain forest area to their own villages so they could grow them locally in their own gardens. They would harvest the cacao seeds, roasting them then grinding the beans into a paste. Chocolate drinks were highly favored by royalty and used in religious ceremonies. Priests presented cacao as offerings to the Gods and would serve the drink during sacred ceremonies. It is believed that the word “chocolate” is derived from the Aztec word Nehuatl the word “chocolatl” which translated means, sour or bitter. The word “atl” meaning water or drink. 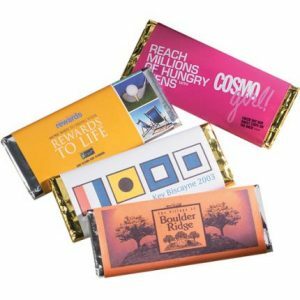 Today’s milk chocolate bar is usually much sweeter than sour or bitter, and makes a great promotional giveaway to feature your custom logo or brand design. Our custom chocolate bars are delicious and sure to please even the most demanding of sweet tooths! If you think that recipients will forget your brand name as soon as they finish eating, remember, don’t underestimate the power of sweet, delicious customized chocolate bars. If the sweet taste of sugar doesn’t convince you, or if you’re just looking for a promotional product to last longer than a few delicious moments, browse through some of our candy and chocolate tins. They’ll remain on your customers’ desktops and in the office well after the candy is finished, while many times the tins can still be used for additional candy or office supplies like tacks and paper clips. We can imprint your company logo design- not only on the chocolate packaging, but also on the chocolate itself! 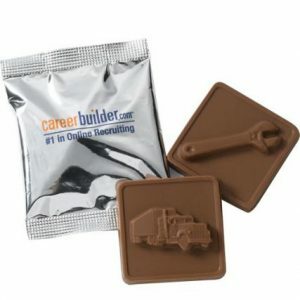 No matter what event or promotional giveaway you are planning, you can’t deny the power of a good, honest, chocolate bar.